An investigation has been launched after a fire damaged a Deeside hotel. 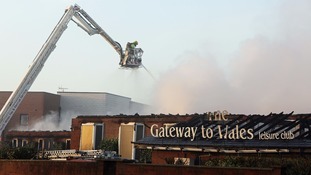 Fire crews are tackling a blaze at the Gateway to Wales Hotel on Deeside. A Flintshire firm has announced it will move to Romania, resulting in 90 job losses. The closure of the Witter Towbars plant in Deeside has been called a 'betrayal' by Unite the union. The employees and their families are devastated, as you would expect. It is ironic that one of Horizon Global’s core values is to be ‘Socially Responsible’. Decent, skilled jobs are being lost and this is a betrayal of the Witter’s employees who have worked hard to make this site and the Witter brand a success over the last 50 years. A new £250m road has been backed by the Welsh Government to help ease congestion on some of Flintshire's busiest roads. Police are appealing for information after a man was stabbed in Flintshire, North Wales. A man arrested after a worker was hit by a HGV at a paper mill in Deeside yesterday, has been released without charge. Emergency services were called to UPM Shotton Paper Mill yesterday morning. The man, who was a contract worker at the mill, died at the scene. North Wales Police says the arrested man has now been released without charge and there will be not further police action. The Health and Safety Executive has taken over the investigation. We are all deeply shocked by this tragic incident. We made the decision to close the whole mill overnight as a mark of respect for the deceased and his family. Staff affected by the incident will be offered support going forward, including counselling as required. We will continue to work closely with all parties to identify the cause of the incident. Ken Skates is now in charge of one of the biggest and high profile briefs in the Welsh Government - Economy and Infrastructure. The new engine production bring with it an extra £7m in investment which includes a grant of more than £700,000 from the Welsh Government. Elderly and vulnerable people are being advised on how to spot distraction burglars. North Wales Police are increasing the number of patrols to combat offenders after a series of distraction burglaries in Deeside. Since we began these patrols there has been a significant reduction in this type of offence. I would advise anyone dealing with cold callers not to let them into your house. If you have a spy hole in your door or a door chain, please use them. Ask to see the caller’s identity card and check it carefully. Genuine callers won’t mind this. If in doubt, close your door. "We are conducting a thorough investigation and are working to establish the full circumstances surrounding Daniel's tragic death" said Detective Chief Inspector Iain Miller, from British Transport Police. We’re eager to talk to any of Daniel's friends or acquaintances, particularly anyone who saw him on Saturday night or since then, as they may be able to help our investigation. We know the last time anyone saw Daniel he was seen sitting on the wall outside the Lady Hamilton public house in Neston, Cheshire in the early hours of Sunday morning. Mr Starr's body was found next to the railway tracks between Neston and Hawarden Bridge railway stations on Monday morning. "A Welsh success story we can all be proud of"